This Monday Morning Starts Fall Session….Following week 4:15 class! Our family has crammed a lot of stuff into a FANTASTIC summer and I am still trying to fit a few last minute things in….not sure I can fit it all in, but I sure am going to try! I will see a facebook page post about a mom taking her girls shopping at Woodfield and I think, “Oh, that sounds like fun, I should do that”, someone else posts how great it is to spend one to one time with each kid and I think, “Oh, I should do that”, another family posts about taking the kids to a Cubs game and I think, “Let’s do that!” Honestly, I don’t think any of this is going to happen because there is a list of things I NEED TO DO!! I need to clean out some closets and maybe even the garage, I need to finish painting the chairs I started painting in May, I NEED to get to the store and get the kids school supplies. There are so many FUN things that I WANT to do still and too many things I NEED to do! Can you believe it? School has started for some and is starting for most of us very soon! Yuck!! The only good thing about getting back to school is that we get to get back to taking care of ourselves on a regular schedule. We got to take a little time off and enjoy the chips and salsa, the bbq’s, and the ice cream treats. You know me, I am the first one to enjoy a summer drink (lots o’ calories), some chips, a big ol’ burger, and of course, a cookie or something sweet for dessert…..BUT it’s that time again! No more vacations for awhile and it’s time to get back in a routine. We start Monday!! We will be having classes on MONDAY, WEDNESDAY, and FRIDAY at 5:15 am. The price for three days a week at this time is $140 for 6 weeks (September 28th) and $250 for 12 weeks which brings us to November 8th. (Side note: one weekend in October may be a little weird, but I will keep you posted). Really, the quote says it all….. The TUESDAY/THURSDAY afternoon class will start NEXT WEEK at Holy Cross Church (I am 99% sure), the 28th and 30th! 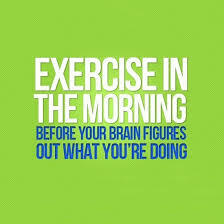 Anyone who wants to come to the 5:15 am class that first week is more than welcome! For example, if you want to do 4 days per week for the full 12 weeks you will pay $310! NEW CLIENT PRICING—-TAKE 20% all fees above….even the bigger packages! ← ONE WEEK MINI SESSION- 5 DAYS for $25! FALL SESSION STARTS August 19th!